You are here: Home / Communication / What are Your Communication Challenges? 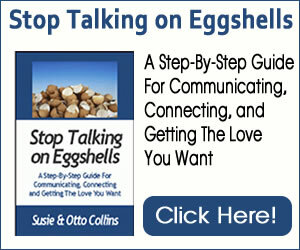 We all have developed communication challenges along the way–unhealthy patterns and ways of avoiding communicating what we are honestly feeling in situations.For us, even though we have a great relationship and work hard at communicating clearly, we sometimes lapse into old patterns when conflict comes up. We’re guessing that many of you do the same. When old patterns come up for Susie, they usually manifest in unhealthy ways like being afraid of speaking her truth if it’s unpleasant for the other person to hear, agreeing for the sake of keeping the peace, and not clearly asking for what she wants. Otto’s communication challenges are making assumptions, imagining fear in the future, black and white thinking, and not speaking about what’s bothering him but letting things build up. What gets in the way of your ability to communicate with the people in your life? Are you immediately defensive when someone starts to criticize something you are doing or calls attention to something you could improve? Do you think one thing and say another? Is your mind always somewhere else instead of listening to the people in your life? Take a few moments and write down the ways that you stop communication with other people. If you have a partner or a close friend, talk over your challenges with them. Talk about ways that you might be able to stop yourself from going into some of these unhealthy communication patterns. Talk about how you’d like to communicate in your life. Clear, honest communication is a skill that can be learned if you have the desire to do so. Making yourself aware of your particular communication issues is one of the first steps to creating close, connected relationships.